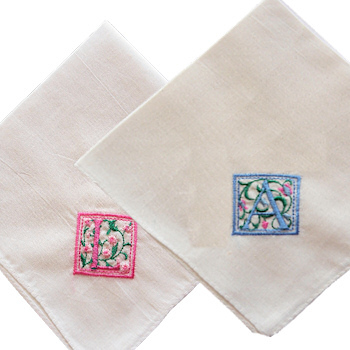 A pair of two ladies cotton handkerchiefs with classic hem edges that can be embroidered with a decorative antique style initial in your choice of colour. The outline border and letter will be sewn in the thread colour you choose, the floral accents will be sewn in complimenting colours. Personalised gifts are specially made to order by Amys Gifts, please allow at least 2 days for dispatch.